Plum curculio, a snout beetle, is an important pest on stone fruits like plums, cherries, and peaches. 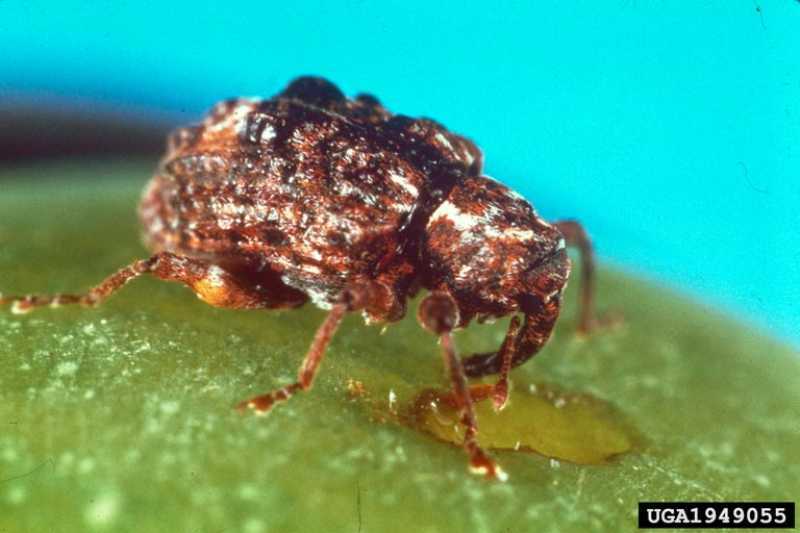 Plum curculio is one of the most serious pests of peach trees; they lay eggs within the fruit and both adults and larvae feed on the fruit, causing brown rot of the fruit. 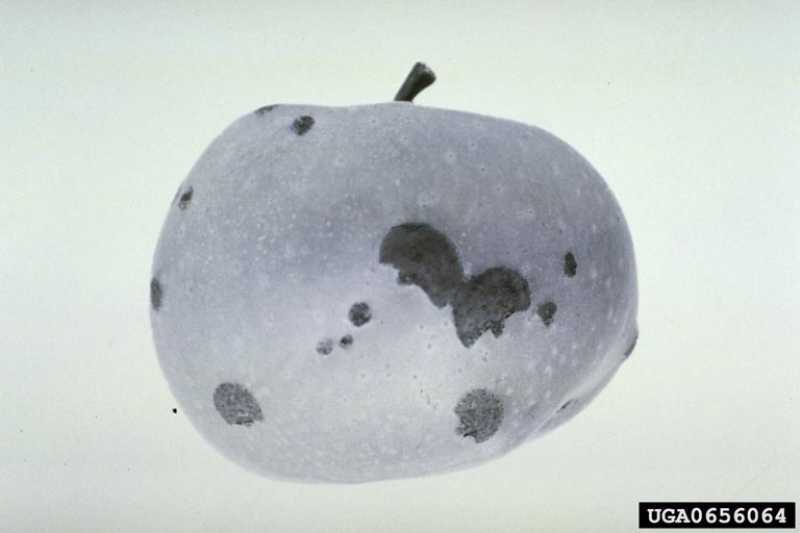 On apples, plum curculio is considered the second most damaging pest after codling moth. Plum curculio beetles, Conotrachelus nenuphar, can be found on plum, cherry, peach, and apple trees, less commonly on nectarine and pear trees. Fruit may fall prematurely, in late May and June. The skin of infected fruit has small crescent-shaped blemishes that eventually become swollen and knotted. Upon closer examination, larvae may be seen feeding near the blemishes. Infested fruit is often hard and misshapen. The larvae create holes in the fruit skin when they leave the fruit to pupate. These holes are clean-cut and free of frass or webbing. Plum curculio beetles are dark brown, about 1/4 inch long, and have a prominent snout, measuring about 1/3 the length of their bodies. They have four characteristic humps on their wing covers. Adults may overwinter in the soil or in hedgerows near host trees. These adults emerge from their overwintering sites to feed on trees in early spring. Females lay eggs within the fruit. 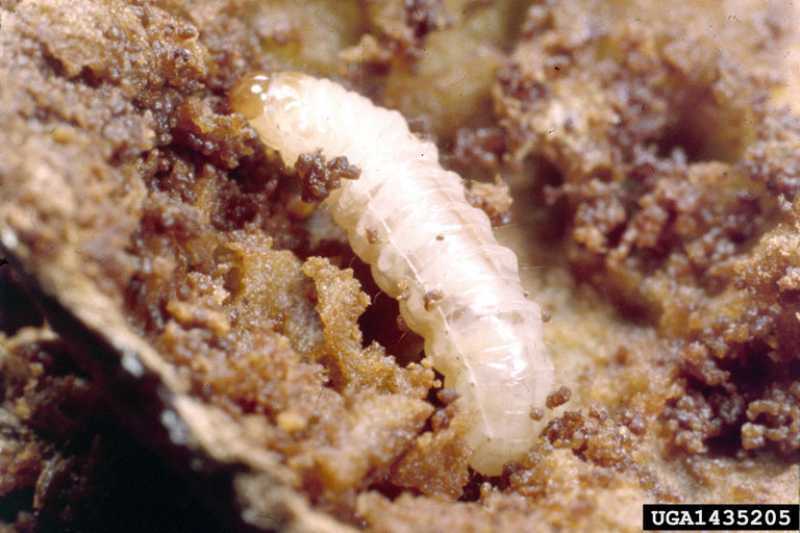 The larvae that emerge from the developing fruit have grayish-white, worm-like bodies with brown heads and can be seen on infested trees in late summer. Larvae may feed on the fruit for 2–3 weeks before they burrow into the ground to pupate. Adults emerge in mid- to latesummer to cause more feeding damage on mature fruit before they overwinter. 1. Shake infested trees. In backyards with only a handful of infested trees, plum curculios may be shaken out of infested trees. This technique works best early in the day when the beetles are sluggish. Lay paper or cloth underneath the trees to collect the beetles. Destroy the collected beetles. 2. Clean up fallen fruit in which eggs or larvae may be developing. 3. Cultivate the soil surrounding infested trees in late spring or early summer to destroy pupating larvae that may have fallen to the ground with the fruit or pupae that may be developing in burrows in the ground. 4. Apply insecticides when populations of adult beetles are severe. Apply carbaryl (Sevin) spray to curb feeding damage and prevent beetles from laying eggs. It is important to delay application of the pesticide until after flower petals drop to avoid harming pollinating insects. Reapply pesticides two more times, at 10–14 day intervals. Other pesticides registered for use include azadirachtin (Bio-Neem, Margosan-O), Beauvaria bassiana, malathion, and pyrethrins. Strategies 1, 2, and 3 are strictly organic approaches. For an organic approach to Strategy 4, consult the Organic Materials Review Institute (OMRI™) for appropriate pyrethrin products.